It wouldn't just be false modesty to say that a couple of weeks ago I wasn't expecting much from my two races in April. The run.je Harbour View run last week really surprised me as I've written about it before but still going into the Fleet Half Marathon my confidence was not high. My foot issues earlier in the year had really only started to clear up in February and I wasn't really running properly until late March. The training sessions I'd put in showed I had some speed but had lost a fair bit of fitness as evidenced by some fairly high heart rate figures. But in the week or so leading up to the Harbour View 5k training had improved significantly but still I didn't feel it was at the levels I was at in the middle of last year. The inaugural run.je event last week changed that. If a sub-25 minute 5k was possible then I surely would be in a position to put in an effort I could be proud of at least. Let's recap a little. 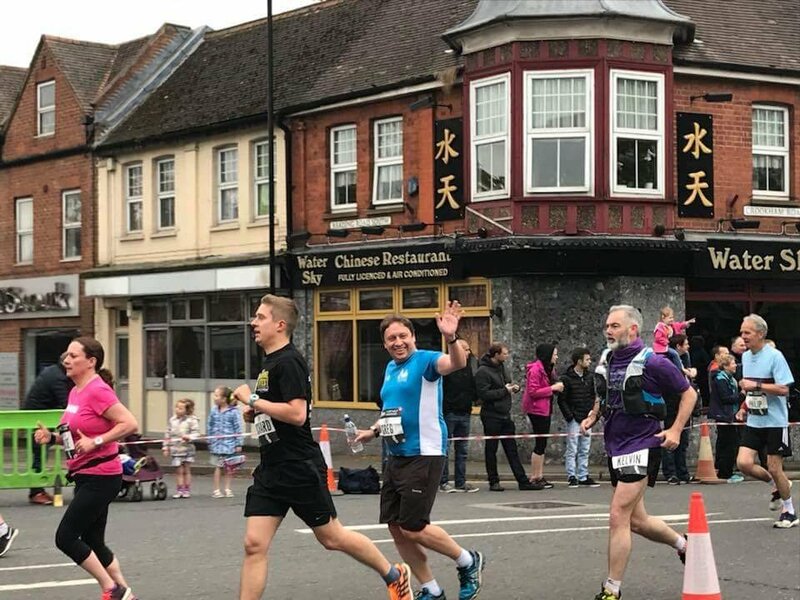 The Fleet Half Marathon was meant to run in March, on the same weekend as the Reading Half, and much like that one fell victim to the snow of the time. However, Fleet said right away they would try and reschedule (Reading said right away they wouldn't) and Fleet made the decision the day prior to the event and had been pretty negative about it the day before that (Reading strung everyone along until two hours before the run). So, the sensible organisers of Fleet said early on when they found their reschedule date that they'd allow transfers of entries. 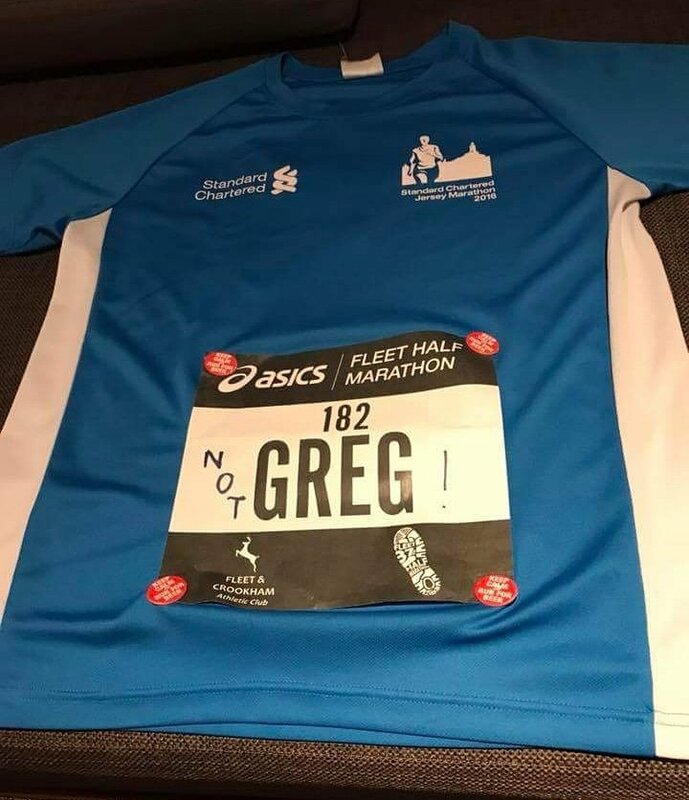 A very simple process then followed and with the generous support of my wife I became a runner with a bib and entry of a Fleet & Crookham AC club runner called Greg. I wasn't settling for being Greg quietly, lovely though I'm sure Greg is, so I became "Not Greg" for the purpose. Or "Greg" as most family members seem to think funny. Anyway, for our trip we picked our daughter up in Reading and then went on to Fleet for the night before the run. The route for the run started out in the very pretty Calthorpe Park. The infrastructure for the event was excellent. Most town roads were closed and the country ones were just very very quiet (or possibly closed, but I don't remember seeing any signs). The first kilo of the run was mainly uphill and my Garmin seemed to be struggling with detecting my speed at the time. I aimed to start with either of the two hour pacer runners but due to crowding at the start I probably crossed the start line a good 20 seconds behind the second one. I didn't panic though. I kept the pacers in sight and caught one around the high street and the second not long after. with people lined up outside the pubs and coffee shops with loads of support. The country parts of the run were much less well supported but they were also quite narrow in places so that wasn't really a bad thing. The course was essentially an outward spiral from the park finishing up the same road we started on, so we ran up Fleet Road twice. The second time was about the 7km point and by that time I had been pretty consistent, all of my kilo times apart from the first one being between 5:28 and 5:38. Being with the pacer no doubt helped that steady progress. I felt good during the first two thirds of the run. The pacer, Kelvin, regularly confirming that we were gaining time on the two hour target throughout with me quietly knowing I had more in mind because I started behind the pacers. Steady progress continued - 5:31, 5:34, 5:32, 5:38, 5:39. 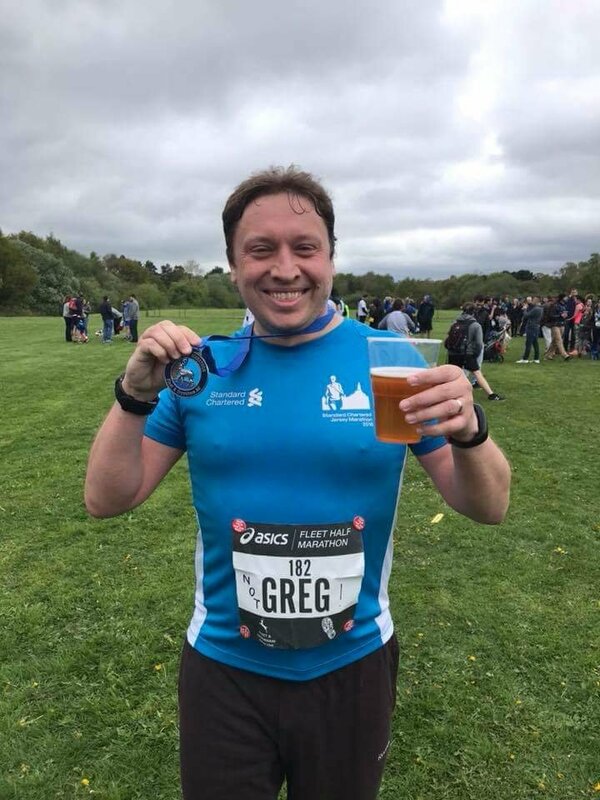 I was down on my best ever Half Marathon time but I didn't feel I was really racing against that. The fatigue started to set in around 13km by the lovely named village of Rotten Green. I decided to head off the front of the pace group just to give myself a clear shot at the following water station so I had one slightly faster kilo then one slightly slower one as I dropped back into the group. The kilometres continued to tick by. Before long Kelvin pointed out that at the ten mile mark, you more or less just have a parkrun to go. For me that meant less than 30 more minutes of hard work. Slightly oddly, Kelvin asked for a song request shortly after that. Someone suggested something a bit downbeat - don't remember what at the moment - he rejected that and started a verse and chorus of Sweet Caroline, joined by one or two people. I joined the chorus only! I decided earlier in the event that I was going to reconsider whether to stick with the group a couple of miles out. I wasn't sure I felt fresh enough to confidently run off the front of the pack at the time so delayed my faster finish. On reflection, that might have been wrong and it cost me a faster time. I considered it again at a mile to go and I just didn't feel happy to go. At a right turn with about 1,000 metres to go I decided that was the time to cut the strings and go for home. I'd been at the front of the group for much of the second half of the race so I just pushed on away. This was down the hill that bothered me at the start earlier. Then there was a right turn at 500m to go as we entered the park and I then finished strong as I often do. I'm told I looked quite fresh at the finish. I overtook probably half a dozen people, if not more, in that final straight crossing the line at a gun time under two hours for the first time ever and a chip time of 1:57:53, exactly a minute outside my PB but probably ten minutes better than what I'd expected weeks before. I was thrilled. I ran so well and, being honest with myself, I could have run better with a bit more confidence to leave the pacer group earlier. Could I have found that minute to get a new PB? Probably not actually, but it might have been close. But I look back not with disappointment at a new best getting away but with tremendous pride at what I did do. Our Jersey flag was flying strongly at the event and I put in an amazing strong run which I really enjoyed. It really couldn't have been much better. We've already talked about coming back next year, although we'll have plenty of time to think about that. If he sees the results after the run, I'd like to think Greg would be proud.